Whistler, Turner, Constable are proto-abstraction, with Malevich and De Stijl the movement comes to fruition. Abstract art is now generally understood to mean art that does not depict objects in the natural world, but instead uses colour and form in a non-representational way. In the very early 20th century, the term was more often used to describe art, such as Cubist and Futurist art, that depicts real forms in a simplified or rather reduced way—keeping only an allusion of the original natural subject. Such paintings were often claimed to capture something of the depicted objects' immutable intrinsic qualities rather than its external appearance. (See abstraction.) The more precise terms, "non-figurative art," "non-objective art," and "non-representational art" avoid any possible ambiguity. Much of the art of earlier cultures – signs and marks on pottery, textiles, and inscriptions and paintings on rock – were simple, geometric and linear forms which might have had a symbolic or decorative purpose. It is at this level of visual meaning that abstract art communicates. One can enjoy the beauty of Chinese calligraphy or Islamic calligraphy without being able to read it. Three art movements which contributed to the development of abstract art were Romanticism, Impressionism and Expressionism. Artistic independence for artists was advanced during the 19th century. Patronage from the church diminished and private patronage from the public became more capable of providing a livelihood for artists. 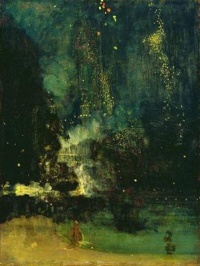 Early intimations of a new art had been made by James McNeill Whistler who, in his painting Nocturne in Black and Gold: The falling Rocket, (1872), placed greater emphasis on visual sensation than the depiction of objects. An objective interest in what is seen, can be discerned from the paintings of John Constable, J M W Turner, Camille Corot and from them to the Impressionists who continued the plein air painting of the Barbizon school. Paul Cézanne had begun as an Impressionist but his aim - to make a logical construction of reality based on a view from a single point, with modulated colour in flat areas - became the basis of a new visual art, later to be developed into Cubism by Georges Braque and Pablo Picasso. Expressionist painters explored the bold use of paint surface, drawing distortions and exaggerations, and intense color. Expressionists produced emotionally charged paintings that were reactions to and perceptions of contemporary experience; and reactions to Impressionism and other more conservative directions of late 19th century painting. The Expressionists drastically changed the emphasis on subject matter in favor of the portrayal of psychological states of being. Although artists like Edvard Munch and James Ensor drew influences principally from the work of the Post-Impressionists they were instrumental to the advent of abstraction in the 20th century. Additionally in the late 19th century in Eastern Europe mysticism and early modernist religious philosophy as expressed by theosophist Mme. Blavatsky had a profound impact on pioneer geometric artists like Wassily Kandinsky, and Hilma af Klint. The mystical teaching of Georges Gurdjieff and P.D. Ouspensky also had an important influence on the early formations of the geometric abstract styles of Piet Mondrian and his colleagues in the early 20th century. Post Impressionism as practiced by Paul Gauguin, Georges Seurat, Vincent van Gogh and Paul Cézanne had an enormous impact on 20th century art and led to the advent of 20th century abstraction. The heritage of painters like Van Gogh, Cézanne, Gauguin, and Seurat was essential for the development of modern art. At the beginning of the 20th century Henri Matisse and several other young artists including the pre-cubist Georges Braque, André Derain, Raoul Dufy and Maurice de Vlaminck revolutionized the Paris art world with "wild", multi-colored, expressive, landscapes and figure paintings that the critics called Fauvism. With his expressive use of color and his free and imaginative drawing Henri Matisse comes very close to pure abstraction in French Window at Collioure, (1914), View of Notre-Dame, (1914), and The Yellow Curtain from 1915. The raw language of color as developed by the Fauves directly influenced another pioneer of abstraction Wassily Kandinsky (see illustration). Although Cubism ultimately depends upon subject matter, it became, along with Fauvism, the art movement that directly opened the door to abstraction in the 20th century. Pablo Picasso made his first cubist paintings based on Cézanne's idea that all depiction of nature can be reduced to three solids: cube, sphere and cone. With the painting Les Demoiselles d'Avignon 1907, Picasso dramatically created a new and radical picture depicting a raw and primitive brothel scene with five prostitutes, violently painted women, reminiscent of African tribal masks and his own new Cubist inventions. Analytic cubism was jointly developed by Pablo Picasso and Georges Braque, from about 1908 through 1912. Analytic cubism, the first clear manifestation of cubism, was followed by Synthetic cubism, practised by Braque, Picasso, Fernand Léger, Juan Gris, Albert Gleizes, Marcel Duchamp and countless other artists into the 1920s. Synthetic cubism is characterized by the introduction of different textures, surfaces, collage elements, papier collé and a large variety of merged subject matter. The collage artists like Kurt Schwitters and Man Ray and others taking the clue from Cubism were instrumental to the development of the movement called Dada. The Italian poet Marinetti published 'The Founding and Manifesto of Futurism' in 1909, which inspired artists such as Carlo Carra in, Painting of Sounds, Noises and Smells and Umberto Boccioni Train in Motion, 1911, to a further stage of abstraction and profoundly influenced art movements throughout Europe. In 1913 the poet Guillaume Apollinaire named the work of Robert and Sonia Delaunay, Orphism. He defined it as, the art of painting new structures out of elements that have not been borrowed from the visual sphere, but had been created entirely by the artist...it is a pure art.
' David Burliuk's knowledge of modern art movements must have been extremely up-to-date, for the second Knave of Diamonds exhibition, held in January 1912 (in Moscow) included not only paintings sent from Munich, but some members of the German Die Brücke group, while from Paris came work by Robert Delaunay, Henri Matisse and Fernand Léger, as well as Picasso. During the Spring David Burliuk gave two lectures on cubism and planned a polemical publication, which the Knave of Diamonds was to finance. He went abroad in May and came back determined to rival the almanac Der Blaue Reiter which had emerged from the printers while he was in Germany'. By 1911 many experimental works in the search for this 'pure art' had been created. František Kupka had painted the Orphist work, 'Discs of Newton'. The Rayist (Luchizm) drawings of Natalia Goncharova and Mikhail Larionov, used lines like rays of light to make a construction. 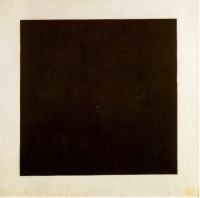 Kasimir Malevich completed his first entirely abstract work, the Suprematist, 'Black Square', in 1915. Another of the Suprematist group' Liubov Popova, created the Architectonic Constructions and Spatial Force Constructions between 1916 and 1921. Piet Mondrian was evolving his abstract language, of horizontal and vertical lines with rectangles of colour, between 1915 and 1919, Neo-Plasticism was the aesthetic which Mondrian, Theo van Doesburg and other in the group De Stijl intended to reshape the environment of the future. Visual art, as it becomes more abstract becomes more like music: an art form which uses the abstract elements of sound and divisions of time. Wassily Kandinsky, himself a musician, was inspired by the possibility of marks and associative color resounding in the soul. The idea had been put forward by Charles Baudelaire, that all our senses respond to various stimuli but the senses are connected at a deeper aesthetic level. Closely related to this, is the idea that art has The spiritual dimension and can transcend 'every-day' experience, reaching a spiritual plane. The Theosophical Society popularised the ancient wisdom of the sacred books of India and China in the early years of the century. It was in this context that Piet Mondrian, Wassily Kandinsky, Hilma af Klint and other artists working towards an 'objectless state' became interested in the occult as a way of creating an 'inner' object. The universal and timeless shapes found in geometry: the circle, square and triangle become the spacial elements in abstract art; they are, like color, fundamental systems underlying visible reality. Many of the abstract artists in Russia became Constructivists believing that art was no longer something remote, but life itself. The artist must become a technician, learning to use the tools and materials of modern production. Art into life! was Vladimir Tatlin's slogan, and that of all the future Constructivists. Varvara Stepanova and Alexandre Exter and others abandoned easel painting and diverted their energies to theatre design and graphic works. On the other side stood Kazimir Malevich, Anton Pevsner and Naum Gabo. They argued that art was essentially a spiritual activity; to create the individual's place in the world, not to organise life in a practical, materialistic sense. Many of those who were hostile to the materialist production idea of art left Russia. Anton Pevsner went to France, Gabo went first to Berlin, then to England and finally to America. Kandinsky studied in Moscow then left for the Bauhaus. By the mid-1920s the revolutionary period (1917 to 1921) when artists had been free to experiment was over; and by the 1930s only social realist art was allowed. The Bauhaus at Weimar, Germany was founded in 1919 by Walter Gropius. The philosophy underlying the teaching program was unity of all the visual and plastic arts from architecture and painting to weaving and stained glass. This philosophy had grown from the ideas of the Arts and Crafts movement in England and the Deutscher Werkbund. Among the teachers were Paul Klee, Wassily Kandinsky, Johannes Itten, Josef Albers, Anni Albers, Theo van Doesburg and Laszlo Moholy-Nagy. In 1925 the school was moved to Dessau and, as the Nazi party gained control in 1932, The Bauhaus was closed. In 1937 an exhibition of degenerate art, 'Entartete Kunst' contained all types of avant-garde art disapproved of by the Nazi party. Then the exodus began: not just from the Bauhaus but from Europe in general; to Paris, London and America. Paul Klee went to Switzerland but many of the artists at the Bauhaus went to America. During the 1930s Paris became the host to artists from Russia, Germany, Holland and other European countries affected by the rise of totalitarianism. Sophie Tauber and Jean Arp collaborated on paintings and sculpture using organic/geometric forms. The Polish Katarzyna Kobro applied mathematically based ideas to sculpture. The many types of abstraction now in close proximity led to attempts by artists to analyse the various conceptual and aesthetic groupings. An exhibition by forty-six members of the Cercle et Carré group organised by Michel Seuphor contained work by the Neo-Plasticists as well as abstractionists as varied as Kandinsky, Anton Pevsner and Kurt Schwitters. Criticised by Theo van Doesburg to be too indefinite a collection he publish the journal Art Concret setting out a manifesto defining an abstract art in which the line, color and surface only, are the concrete reality. Abstraction-Création founded in 1931 as a more open group, provided a point of reference for abstract artists, as the political situation worsened in 1935, and artists again regrouped, many in London. The first exhibition of British abstract art was held in England in 1935. The following year the more international Abstract and Concrete exhibition was organised by Nicolete Gray including work by Piet Mondrian, Joan Miró, Barbara Hepworth and Ben Nicholson. Hepworth, Nicholson and Gabo moved to the St. Ives group in Cornwall to continue their 'constructivist' work. During the Nazi rise to power in the 1930s many artists fled Europe to the United States. By the early 1940s the main movements in modern art, expressionism, cubism, abstraction, surrealism, and dada were represented in New York: Marcel Duchamp, Fernand Léger, Piet Mondrian, Jacques Lipchitz, Max Ernst, André Breton, were just a few of the exiled Europeans who arrived in New York. The rich cultural influences brought by the European artists were distilled and built upon by local New York painters. The climate of freedom in New York allowed all of these influences to flourish. The art galleries that primarily had focused on European art began to notice the local art community and the work of younger American artists who had begun to mature. Certain of these artists became distinctly abstract in their mature work. Some artists of the period defied categorization, such as Georgia O'Keeffe who, while a modernist abstractionist, was a pure maverick in that she painted highly abstract forms while not joining any specific group of the period. Eventually American artists who were working in a great diversity of styles began to coalesce into cohesive stylistic groups. The best known group of American artists became known as the Abstract expressionists and the New York School. In New York City there was an atmosphere which encouraged discussion and there was new opportunity for learning and growing. Artists and teachers John D. Graham and Hans Hofmann became important bridge figures between the newly arrived European Modernists and the younger American artists coming of age. Mark Rothko, born in Russia, began with strongly surrealist imagery which later dissolved into his powerful color compositions of the early 1950s. The expressionistic gesture and the act of painting itself, became of primary importance to Jackson Pollock and Franz Kline. While during the 1940s Arshile Gorky's and Willem de Kooning's figurative work evolved into abstraction by the end of the decade. New York City became the center, and artists worldwide gravitated towards it; from other places in America as well. A commonly held idea is that pluralism characterizes art at the beginning of the 21st century. There is no consensus, nor need there be, as to a representative style of the age. There is an anything goes attitude that prevails; an "everything going on", and consequently "nothing going on" syndrome; this creates an aesthetic traffic jam with no firm and clear direction and with every lane on the artistic superhighway filled to capacity. Consequently magnificent and important works of art continue to be made albeit in a wide variety of styles and aesthetic temperaments, the marketplace being left to judge merit. Digital art, computer art, internet art, hard-edge painting, geometric abstraction, appropriation, hyperrealism, photorealism, expressionism, minimalism, lyrical abstraction, pop art, op art, abstract expressionism, color field painting, monochrome painting, neo-expressionism, collage, decollage, intermedia, assemblage, digital painting, postmodern art, neo-Dada painting, shaped canvas painting, environmental mural painting, graffiti, figure painting, landscape painting, portrait painting, are a few continuing and current directions at the beginning of the 21st century. Into the 21st century abstraction remains very much in view, its main themes: the transcendental, the contemplative and the timeless are exempified by Barnett Newman, John McLaughlin, and Agnes Martin as well as younger living artists. Art as Object as seen in the Minimalist sculpture of Donald Judd and the paintings of Frank Stella are still seen today in newer permutations. The poetic, Lyrical Abstraction and the sensuous use of color seen in the work of painters as diverse as Robert Motherwell, Patrick Heron, Kenneth Noland, Sam Francis, Cy Twombly, Richard Diebenkorn, Helen Frankenthaler, Joan Mitchell, among others. There was a resurgence after the war and into the 1950s of the figurative, as neo-Dada, fluxus, happening, conceptual art, neo-expressionism, installation art, performance art, video art and pop art have come to signify the age of consumerism. The distinction between abstract and figurative art has, over the last twenty years, become less defined leaving a wider range of ideas for all artists. Unless indicated otherwise, the text in this article is either based on Wikipedia article "Abstract art" or another language Wikipedia page thereof used under the terms of the GNU Free Documentation License; or on original research by Jahsonic and friends. See Art and Popular Culture's copyright notice. This page was last modified 20:05, 9 March 2019. This page has been accessed 11,448 times.